ROTD 2.8 (not beta anymore ) is out. Please post all questions, feedback, bugs etc. in this topic. Could you please post few promotional screenshots, so I can spread the word? I'll upload some in a few hours, was too tired last night. I'm working on a promo video as well, which I'll upload to youtube once it's ready. Maybe you could wait with a news post until both are up. Done. Well, the "promo video" is just a simple recording of a battle, but I simply don't have time for anything more fancy. Cosmetical bug fix (RR*): The Nod SSM no longer appears as (unbuildable) item in the build list when a GDI player builds a Repair Bay. Cosmetical bug fix (both): Parachute is now positioned correctly and uses the correct color palette. Cosmetical tweak (RR): The A10's napalm bombs now use a larger explosion animation by default instead of only when they have reached elite status. Gameplay tweak (both): Changed the way troops are paradropped by the transport heli to a RA1-like paradrop (paradropping while flying over target). Gameplay tweak (Classic): Transport helicopter health increased from 118 to 120. Gameplay tweak (RR): Transport helicopter price reduced from 1500 to 1200. Gameplay tweak (RR): Transport helicopter health increased from 118 to 150. 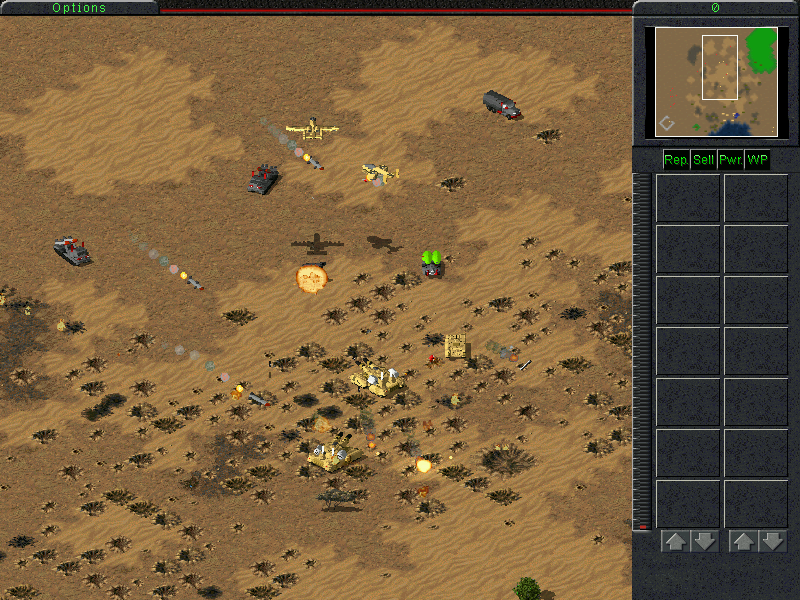 Gameplay tweak (RR): Transport helicopter speed increased from 11 to 14. Gameplay tweak (RR): Amount of health points regained by buildings per repair 'tick' reduced from 8 to 6. Gameplay tweak (RR): Repair cost factor reduced from 40% of full price to 25% of full price. Gameplay tweak (RR): Harvester harvesting speed was slightly increased. Gameplay tweak (RR): Harvester turning speed increased from 3 to 5. Gameplay tweak (RR): Harvester health points increased from 720 to 840. Balance tweak (RR): Rocket Launcher reload time decreased by 10%. Balance tweak (RR): GDI weapons factory health points increased from 480 to 720. 온라인 개인 정보 보호 정책을 사용할 수 없으면 오프라인으로 개인 정보 보호 정책을 읽으십시오. 1. look into your ROTD directory, if you can find a file called except.txt please upload it here. 2. Try Win98/ME compatibility mode. Does it help? downloaded it and compared to the last version of RotD i remember playing, which i think might have been 2.6?, it's quite a bit different from what i remember. Played a few matches on both normal and Reaperrr rules and it seemed pretty good fun. I don't play TS as often as I used to obviously but i found at times the AI seemed to be fairly smart and the attack teams they use can be in some cases pretty hefty. Had one Nod team attack me one time with a very nicely mixed group of tanks. Can't say i noticed any bugs with the gameplay and functionality of the mod. About all I noticed were what seemed to be shore errors on one or two maps. Particularly the Jurassic Map is the one i can recall from. But again it was fun to play. Good job Reaperrr. Figured since I did download it and play it I'd best leave a comment. yeah one of the downsides of the new shores is that shore errors become much easier to spot than with the normal TS terrain (the maps have always had those errors, but with the TS shores you don't notice them that much). Should I ever release another update this would be one of the issues I intend to adress. I can't get finalsun to work, every time I try to open it is says "tiberian Sun is not installed correctly. (Tibsun.mix could not be loaded.)" how did you "fix" the problem? missing graphics can only mean some mix file(s) aren't properly loaded. Hey there people, hope I'm not bumping into anyone's discussions or whatnot..
Anyways, I'm wondering what palette the chain link fence uses? I've been trying everything I know to implement it into regular TS(with Firestorm), but I just can't get it to work. I've used every palette file I can find and yet it the image doesn't appear in-game. I'd really appreciate it if someone could give me some advice or instructions. When generating a preview of a random map in Reaperrr's Rules skirmish mode, the progress bar will move up to about 4/5'ths of the way and then just sit there forever, forcing me to kill the program and start over. This only happens when using Reaperrr's Rules. When previewing a random map in vanilla mode it finishes in about less than two seconds, as it's meant to. If it matters, I'm using a dual-core computer running 64-bit Win 7. I have encountered no other problems with either modes, so I guess it's a fluke. * Barracks should be able to heal loaded infantry like the Hospital structure, or make the Hospital a buildable structure (Tech level 2, requires Barracks). * Add Medics for both sides. Any transport with a Medic inside of it heals loaded troops like a Hospital (albeit at a slower rate). Medics are similar to those in Red Alert, but can also attack using a rifle weapon like the Minigunners/Rifle Infantry (they will prioritize healing over shooting however). Medics might cost $500 (Tech level 2-3). * Allow Engineers to perform field repairs on vehicles. They will passively (or actively, by having it click on a vehicle, or force attack a transport it can enter) heal one allied vehicle adjacent to them. This repairing is similar to the Mammoth Tank's auto-repair, costing no resources, but taking effect slowly. An Engineer can only repair a vehicle up to half its maximum HP unlike the Service Depot. * Commandos should gain the ability to place C-4 on vehicles as per Red Alert 2 Tanya (perhaps costing more as a result). * Tiberian Sun style gates. This was a great addition to the game, and one that should be added in RotD like linking walls. Hm... I think I know what causes this. Reaperrr's Rules uses TS Firestorm mode, and FS' random map generator probably tries to place FS terrain pieces that were not included with ROTD, and hangs when it doesn't find them. If I ever find myself making another update for ROTD, I'll try to fix this, until then you'll have to generate those random maps in Classic mode. I'm afraid most of this simply isn't possible in TS, since the engine lacks support for these features. Surely Medics are doable, since Tiberian Sun has them? Could not something similar be adopted for Engineers? As for the Hospital, sounds good. I would price it at around $500; costs less than the Repair Bay, but this is because infantry are generally much more expendable, and are slower (and less able to get back for treatment), thus it is typically less useful/practical. Medics can only heal infantry like they did in TS; not inside a vehicle. Infantry cannot repair vehicles, nor can vehicles heal infantry. Neither is C4 possible to be placed in vehicles, that's a RA2 logic. In YR/RA2 it is use malee range weapon that deal 10000 damage to vehicle armor. It is possible but you must scarified some armor to make this work and impossible to get C4 cursor. Well yeah, I was more thinking of the Ivan bomb logic for some reason. 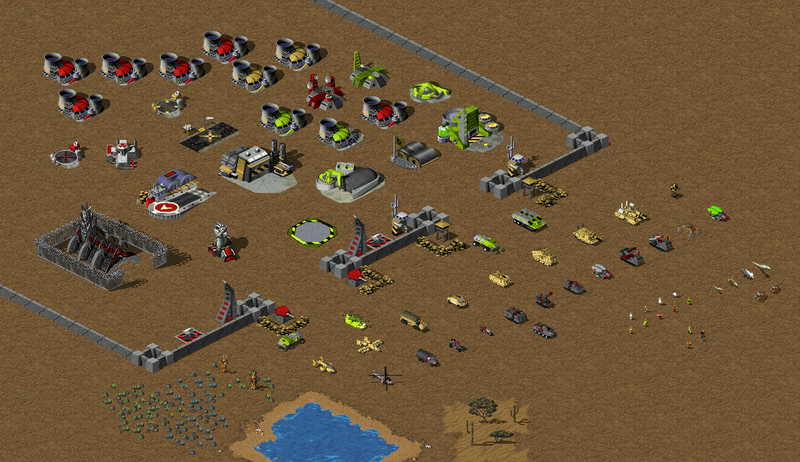 I mean implementing Medics as they're featured in Tiberian Sun (with a rifle attack if possible). Ok, that part might be possible. Can't promise it though, the hack used to make the XO powersuit have 32 facings instead of 8 is rumored to break TS' Medic logic (a different mod, Dawn of the Tiberian Age, didn't have Medics for the same reason). Wait... That I just don't get. Medics get broken by the 36 facings hack? Oh, and one final thing: all veteran units should have regeneration. Encourages and rewards good micro, and ensures your precious micro investment won't go to waste due to wear and tear attrition tactics. Wait... That I just don't get. Medics get broken by the 3s facings hack? DTA does have medics in the enhanced mode actually, but they're indeed messed up. The problem is that when a medic heals an infantry, it doesn't stop healing it once it has restored that infantry's full health, but it'll instead keep healing it until it's given a different order. This means that when you send the medic at a group of injured infantry, the medic will only heal a single one of them unless you either manually order it to heal every single infantry of that group or press "S" on your keyboard (to give it a stop order) every time it has recovered an infantry's full health. Since I ruled out this to be a coding error, it is indeed possible that this is caused by the 32 facing hack. If RotD has the same problem as well, that'd confirm the 32 facing hack to indeed be the cause (if not, a different hack must be causing it in DTA though...). This game always has strange bug. Example, I remove NASAM due final sun error. It make trigger "build building type..." didn't work anymore. Properties: Enables building of power suits (instead of Advanced Communications Centre), enables the Advanced Communications Centre to deploy the Hunter Seeker. To maintain the balance, the Bio Research Facility grants Nod the ability to fire Tiberium Missiles from the Temple of Nod. Properties: Is cloaked. Can infiltrate buildings. The function of an infiltrated building is disabled for 30 seconds (power goes down when a power plant is infiltrated for example, player can no longer build vehicles if a war factory/airstrip is infiltrated, etc...). If the Chameleon Spy is not doable, then just have the Medic available to both sides. As already said above, the Medic as you want it, is not possible. You can't give it a weapon and healing ability. The same is true for the ChamSpy. Beside the fact, that the special infiltrate disabling behaviour is not possible (there simply doesn't exists such a logic in TS), you also can't have an infiltrating unit with a weapon (like the armed engineer this isn't possible without causing bugs). However the ChamSpy could get a shortrange (melee) weapon with an EMP warhead and a damaging muzzleflash anim. This way the unit would destroy itself (due the muzzleflash anim) and disable for a short period the targeted object (building and/or unit). Yeah, if it isn't possible to give either one a weapon, then just having them perform their primary functions is fine. I like the idea for the Chameleon Spy improvisation. Also think that the power down option should remain for Reaperrr's Rules. Adds more strategic depth to the game IMHO. Um... What part of is_not_possible didn't you understand? 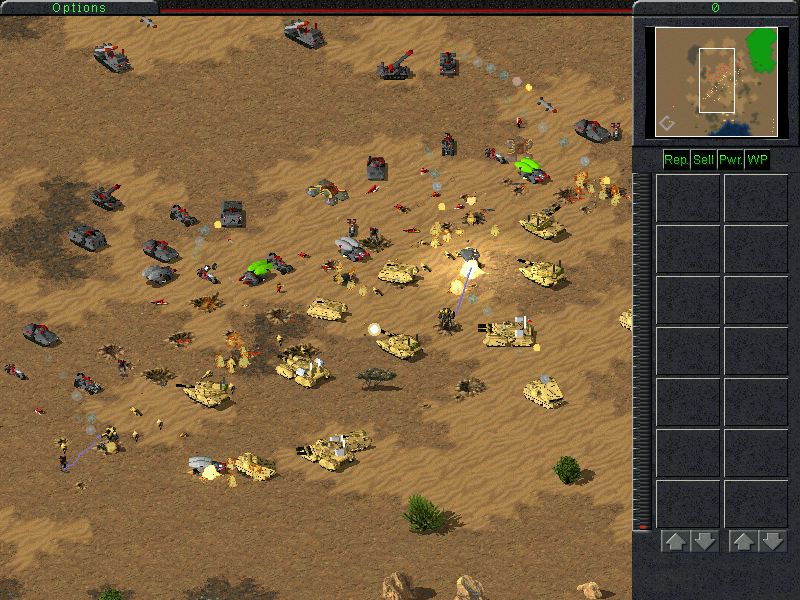 Uh, how is the Tiberian Sun power down option '_not_ possible'? It's part of the base game, and has, as far as I can tell, been purposely disabled. Lightning bolt icon on Sidebar. It's the first time that's been brought up then FAFAIK... Did anyone imply that option should be removed then? The power down function is still there, I just used a button 'Pwr.' instead of the lightning icon. Right now, only Com Center and base defenses can be powered down, though. If I'll ever release another patch, I'll make it so that production facilities, Adv. ComCenter and the Temple can be disabled as well.